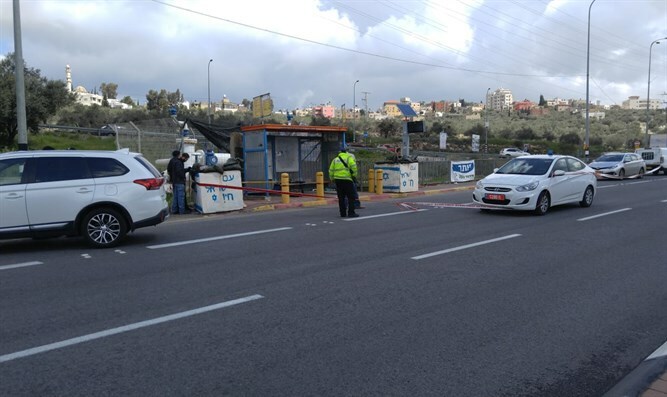 1 killed, 2 hurt as terrorist opens fire at Ariel Junction, Gitai Avisar Junction. One person was killed in a double shooting attack that took place in Samaria Sunday morning. The first attack occurred at the Ariel Junction. Many security forces were dispatched to the site, as well as Magen David Adom paramedics, who treated the wounded. A short time later, the attacker apparently struck again at the Gitai Avisar Junction, a few miles west of the entrance to Ariel. Three people were wounded in the attacks. One of the victims later died of his injuries. An initial investigation revealed that the terrorist apparently stabbed an Israeli youth, stole his weapon and shot him. He then fired from his vehicle at the Gitai Avisar junction and fled in the direction of Barkan. A directive was issued to close the gates in all localities in central Samaria as security forces hunt for the attacker. Samaria Regional Council head Yossi Dagan said in response to the double attack: "We are reinforcing the heroic IDF soldiers, and rely on the defense establishment and the IDF to reach these despicable terrorists and liquidate them." "We never break down, never retreat. Settlement in Samaria is part of the people of Israel and part of the State of Israel. All the residents of Samaria, together with all the citizens of the State of Israel, rely on the IDF and strengthen the heroic soldiers," Dagan said.